Today I did something I haven’t done in a long time. I ruined some really good food. Or an idea of good food. I had this great recipe lined up. Seared scallops with orange saffron cream. While the sauce was going on the stove I started to arrange the photographs, the still lifes, like I do. For the first time ever I got to play around with my dad’s fancy digital camera. And…I got carried away. So that when I finally remembered the sauce, finally checked on it, it had…broken. I find that out of misery often comes… pretty things. My computer broke this week. I thought it was gone for good. Luckily, my roommate Alan was on hand to reign in the situation. I’m now blessedly typing this from my very own computer, which despite being a little worse for the wear, runs great. Anyway, my point is, out of anxiety for my computer (and all the files on my hard drive, including not-yet-published photos for this blog,) was born this dish: sea bass with sauteed spinach, watercress, radishes, poached potatoes, and a salmon roe garnish. Not having my computer, and the distractions it brings, freed up my time to do whatever else I wanted. And I always want to cook. Let’s talk about writing recipes for a minute. It’s easier than you might think. More than anything, it’s about knowing what tastes good to you, and what doesn’t. My favorite way to come up with recipes is to re-invent dishes I don’t like very much. For example, ever since I was little, I never really liked salmon. Cooked salmon, I mean. The raw stuff is, has always been, heavenly. It was something about the way the fatty bits would form strings of white film on the surface of the broiled meat, like membranous seafoam or toothpaste. It turned me off. Is there any meal more indulgent than brunch? I don’t think so. It’s an excuse to drink hard liquor before noon, an excuse to fry pancakes and eggs in bacon grease and eat too many bagels. Do I need to say it? I love brunch. My favorite brunch meal is Eggs Benedict. I order it at restaurants whenever I can, but for me there’s nothing quite like the homemade version. Because at home, even despite the famous fussiness of Hollandaise sauce, I can make it the way I like it. And that is with salmon cakes. Not Canadian bacon, not smoked salmon, but salmon cakes. You know–like crab cakes, but… with salmon. It has the richness of a crab cake but not the overwhelming saltiness of smoked salmon. The recipe I used is based on Ina Garten’s salmon cake recipe here. This recipe makes four gargantuan servings. Before we set to work preparing these guys, Alan was in our dining room shucking 20 blue point oysters with a flat edged screwdriver. His hands were cut and red and the floor and his sweater were littered impossibly with oyster shell shavings. But then our apartment was filled with the smell of the sea, which he said he loved. From floor to ceiling the atmosphere was all salt water, sand, tide pool, sea anemone. Oysters. There is no smell like it in the world. To me it smells like memory, like watching the gray backs of dolphins peep out from beneath the white caps at Zuma beach. I can’t think of a more romantic food in the world. When buying oysters, ask your fish monger when they were harvested. If they have been out of the water for less than a week, you’re good to go. And as for the flat-edged screwdriver, it’s a great tool for shucking oysters if you don’t have a shucking knife. 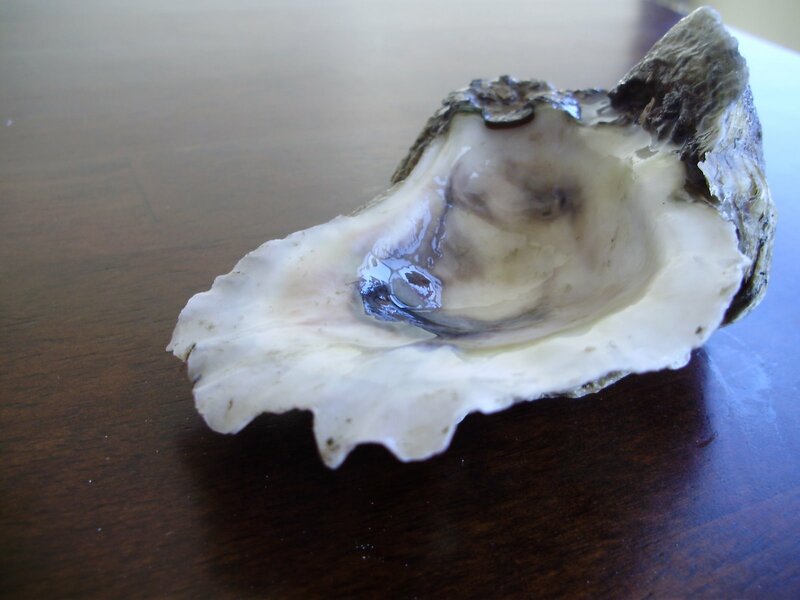 Just be sure to hold the oyster with a kitchen towel to protect your hands from small cuts. The best way to eat oysters is plain. A squeeze of lemon juice and you’re golden. 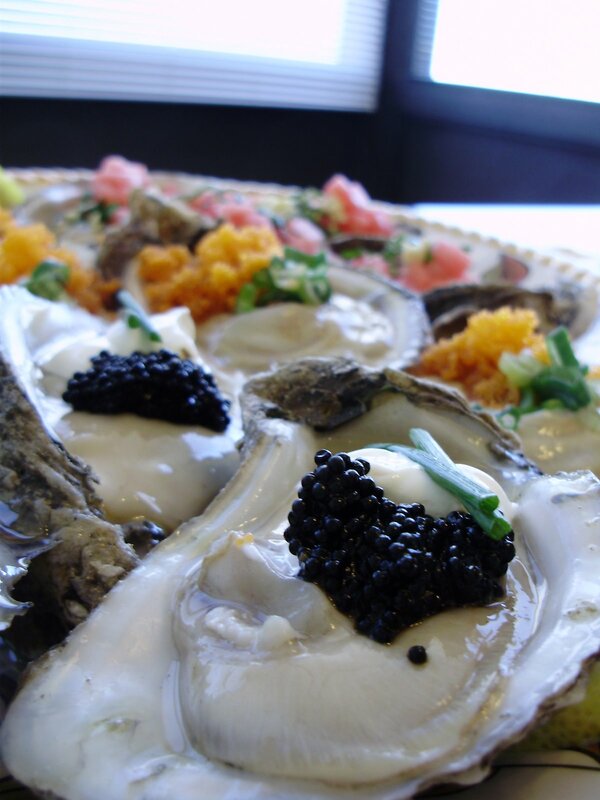 But for Valentine’s Day, these three oysters are a nice departure from the norm and a fancier take on a food I love. 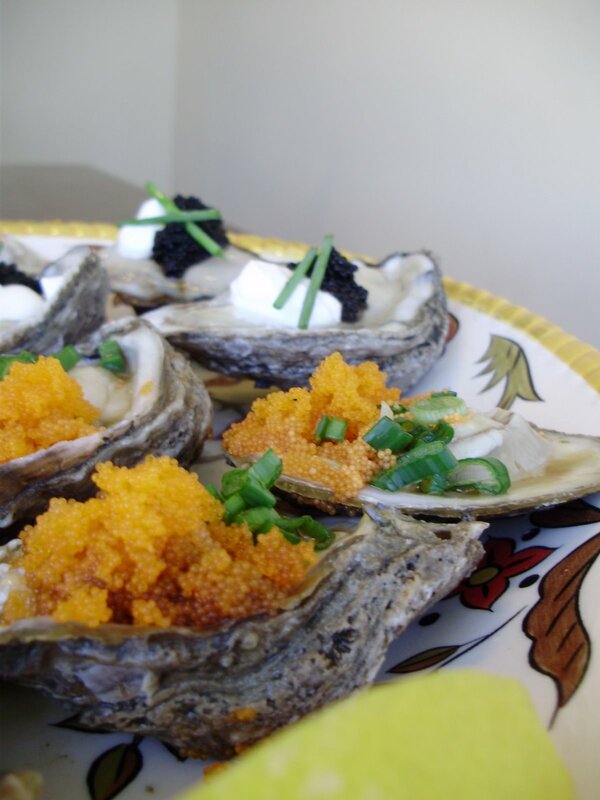 Top each oyster with 1/2 tsp of sour cream and 1 tsp of American black caviar. Place 2 1/2 inch chive slices over the sour cream and caviar. Squeeze fresh lemon juice onto each. 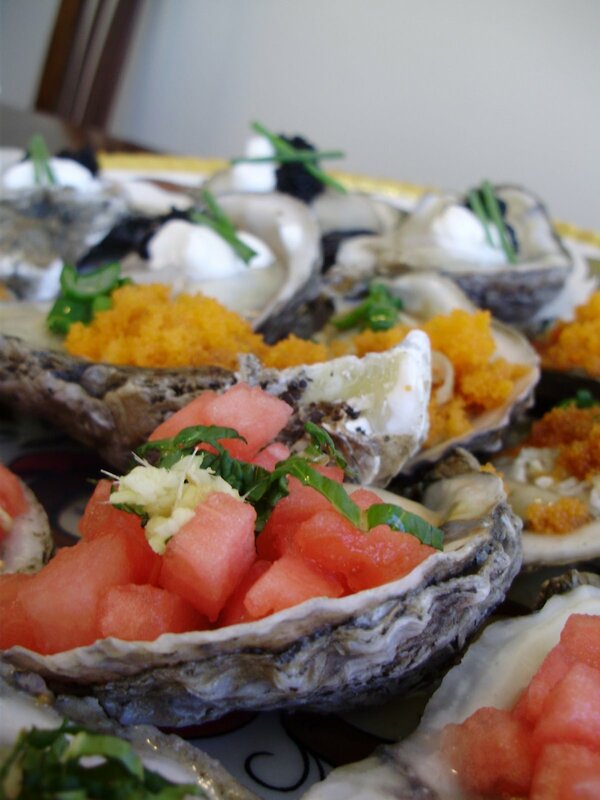 Place 1 tbsp diced salted watermelon onto each oyster, along with a small dab each of julienned mint and minced ginger. Finish it off with a squeeze of fresh lemon juice. Place 1/2 tbsp of smelt roe on each oyster along with a pinch of thinly sliced scallions. Top each with a tsp of ponzu sauce and a squeeze of lemon juice.